'In the months that followed I watched His Holiness working on a new book... I began to think that perhaps the time had come for me to turn my paws to a book of my own . . . one that tells my own tale . . . How I was rescued from a fate too grisly to contemplate, to become constant companion to a man who is not only one of the world's greatest spiritual leaders and a Nobel Peace Prize laureate, but who is also a dab hand with the can opener.' 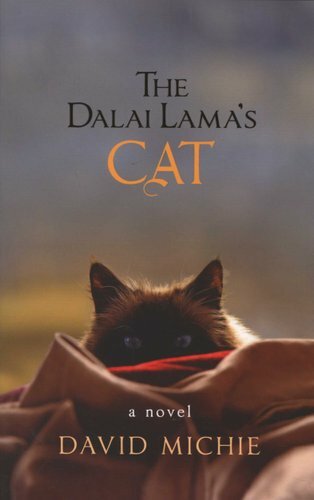 Not so much fly-on-the-wall as cat-on-the-sill, this is the warm-hearted tale of a small kitten rescued from the slums of New Delhi who finds herself in a beautiful sanctuary with sweeping views of the snow-capped Himalayas. In her exotic new home, the Dalai Lama's cat encounters Hollywood stars, Buddhist masters, Ivy-league professors, famous philanthropists, and a host of other people who come visiting His Holiness. Each encounter offers a fresh insight into finding happiness and meaning in the midst of a life of busy-ness and challenge. Drawing us into her world with her adorable but all-too-flawed personality, the Dalai Lama's cat discovers how instead of trying to change the world, changing the way we experience the world is the key to true contentment. 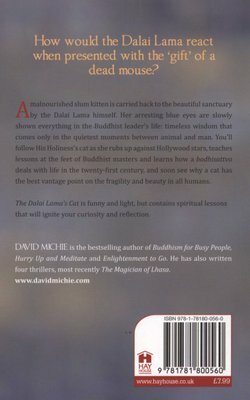 Featuring a delightful cast of characters, timeless Buddhist wisdom, and His Holiness's compassion pervading every chapter, The Dalai Lama's Cat is simply enchanting.